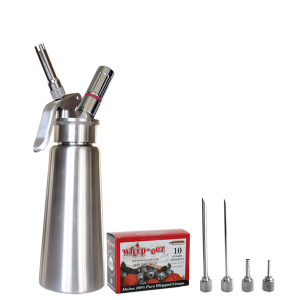 This unique 1/2 liter whipped cream dispenser has an aluminum body and a solid high impact composite head. The tips on this model have the metal base built in. No longer do you need to have 2 parts (base and tip). 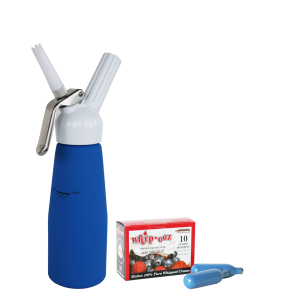 · Included are three (3) one piece decorating tips and a charger holder. 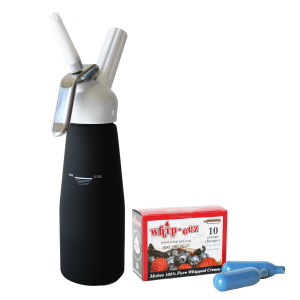 Whip-eez brand whippers reflect over 60 years of manufacturing expertise. 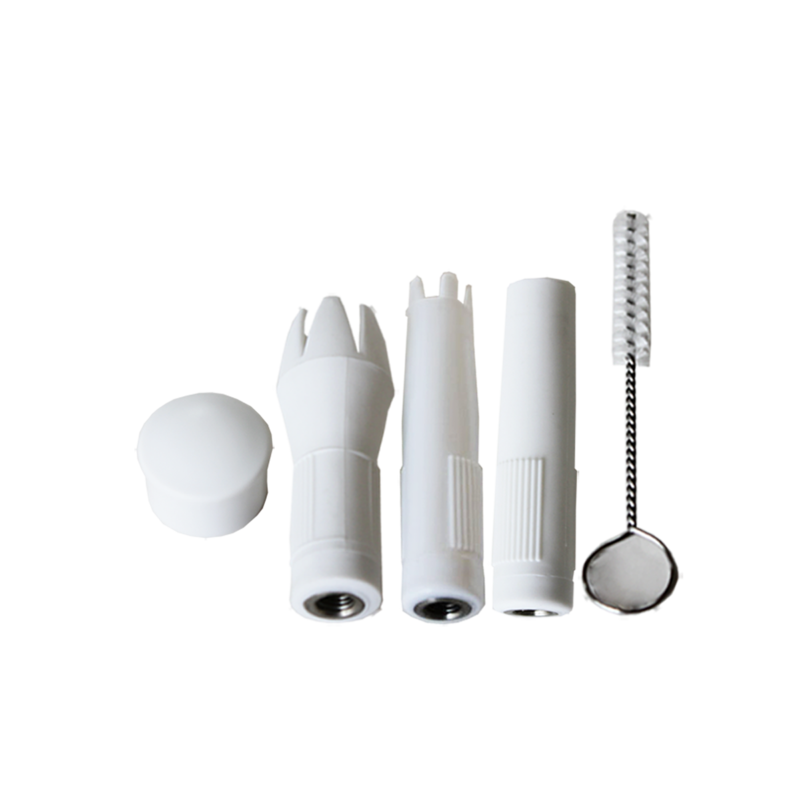 These Cream Whippers are the perfect kitchen tools to whip up creams, flavored toppings and mousses. 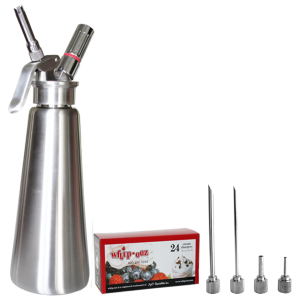 This aluminum cream siphon will withstand intense in home and restaurant use. 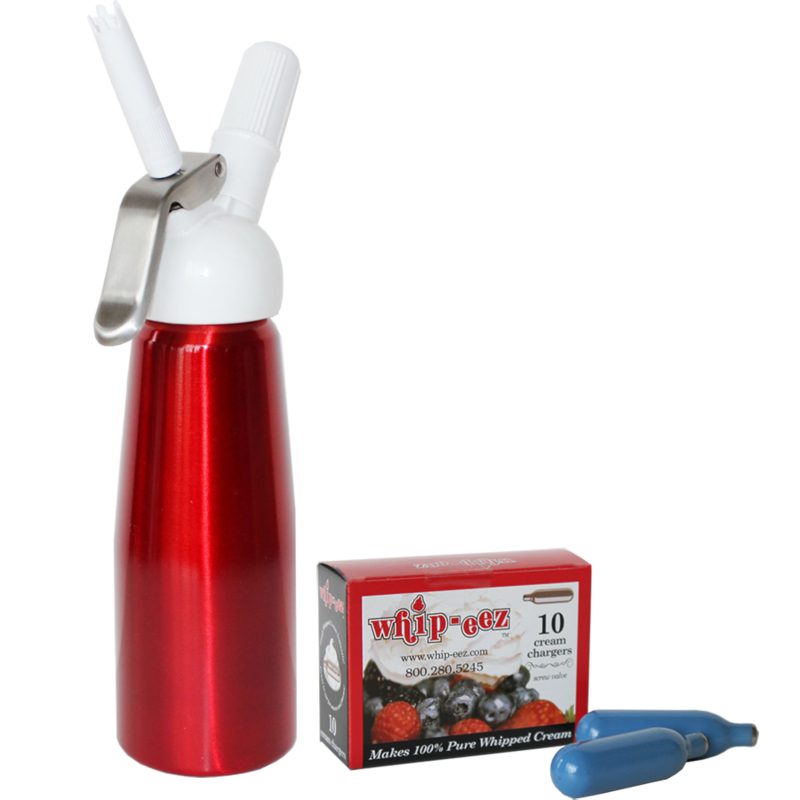 A decorator tip is connected to the whipper head with a metal adapter, allowing the decorator tips to be conveniently removed for cleaning while the whip cream canister is under pressure. 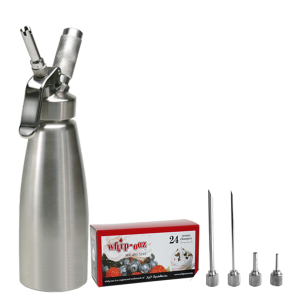 This aluminum cream siphon is equipped with a specially designed strong and durable steel lever system allowing perfect dispensing and decorating. Great choice of colors. I bought the red one. Wow! The shine on this looks expensive. My older gold color whipper (that I bought here) still works too. I actually like this plastic head better than my older aluminum head. It’s just easier to wash and keep cleaner. 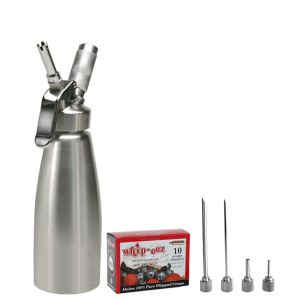 These guys helped me out when I had questions about my whipper. Turns out, they sell the parts that I needed. I’m sure glad I bought it here. 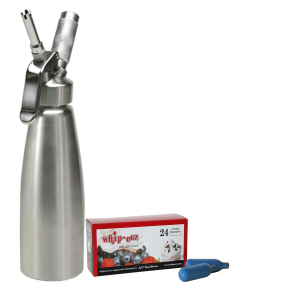 No more reddiwhip cans for me. I just purchased a red one and used it 6 times. All 6 times the whip cream came out thick and wonderful. I was surprised with the good quality for only $30 bucks. Now I can use food coloring for some pazazz that I couldn’t with the reddiwhip cans. Plus, I control the ingredients. Cleaning it is no problem either. I read a few reviews on how difficult it is since you can not put it in the dishwasher, but that is not true. I just soak the unit in warm soapy water. Included in the parts is a pipe cleaner. It probably took a whole minute to wash and rinse it out. This is one of those things that I wish I would have purchased years ago. Anyone heard of “whipped lightning”? 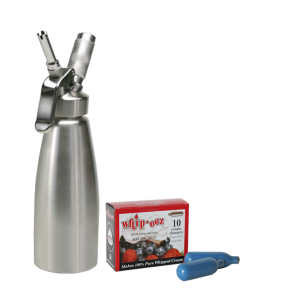 Well, instead of buying cans of that, just make your own, with your own brand of alcohol, with one of these. It is amazing. I’ll bet they are selling these like no other business. 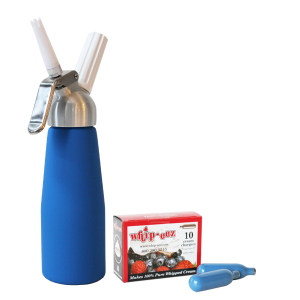 It is so easy to use, I love it. The whipper seems like I should have spent more money on it. The pictures don’t do it justice, it just looks and feels like an expensive tool. I don’t know how they do it. Great job whip-eez guys!